tools to navigate your transition into parenthood. "I was hoping to have a hospital birth without any pain medication. My labor was all in my back though and it made it excruciating. I was happy that Kaya had taught us comfort positions and tools to use at home for the pain that gave me relief and that I felt good about getting an epidural when we were admitted in the hospital. I was worried before Kaya's class that getting any pain medication would make it next to impossible to avoid a c-section but she made sure that we felt safe and comfortable choosing to use them. My epidural was wonderful! And I pushed my baby out just a few hours after getting it without a problem." 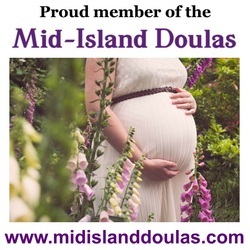 Suitable for families birthing with doctors or midwives, at home or in the hospital on Vancouver Island. This is a comprehensive prenatal class in a group setting for expecting parents and their birth partners. Focusing on practical and realistic tools to help your transition into parenthood. - Comfort measures for pregnancy, labor, vaginal birth, cesarean birth, and postpartum. - Preparing for baby and managing expectations. - Planning for postpartum success. - Hospital tour (depending on availability). Classes are held at the Matraea Centre in the classroom. This is a comprehensive prenatal class in the privacy of the Matraea Centre or your home, for expecting parents and their birth partners. Focusing on practical and realistic tools to help your transition into parenthood. *Information is tailored to your unique birth preferences. ​Classes are held at the Matraea Centre or in your home. *Semi-private classes available for $175/birth team with a minimum of 2 families.